The ASEAN and East Asia summits ended with little progress having been made on the bloc’s most contentious issues. Outgoing Chinese Premier Wen Jiabao returned to Beijing this week office after disappointing ASEAN and East Asia summits that failed to live-up to years of diplomatic posturing and positioning, designed to protect his country’s territorial ambitions in the South China Sea. The pro-Beijing lobby will no doubt praise his efforts in Cambodia where China successfully thwarted attempts by Southeast Asian countries to unite on the South China Sea issue. But behind closed doors the honest power-brokers will be forced to admit that at best Beijing achieved a year-long stalemate before a significant political shift within the Association of South East Asian Nations (ASEAN), which will not be to its liking. Wen’s departure also signaled an ignoble end to Cambodia’s controversial year as chair of ASEAN, marked by Prime Minister Hun Sen’s extraordinary efforts to please Beijing that exposed deep and acrimonious divisions within the 10-member bloc. China has invested heavily in Cambodia with Chinese companies investing $8.2 billion in the poverty-stricken country since 2006 alone, not to mention the billions in aids and soft loans that Beijing has given to Hun Sen’s government with no strings attached. Such magnanimity is rare but seemed questionable over the last six months with China leaning on Phnom Penh to protect Beijing’s interests within ASEAN on the thorny issue of the Spratly and Paracel islands. China claims almost the entire resource rich South China Sea, including the Paracel islands, which are also claimed by Vietnam. The Spratly Islands and the sea lanes of communications, where half the world’s trade passes, are claimed in whole or in part by China, Vietnam, Malaysia, Taiwan, Brunei and the Philippines. 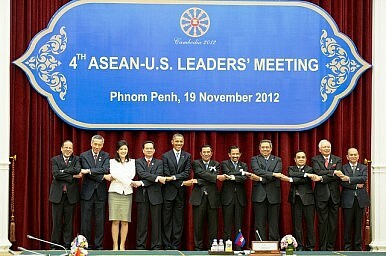 From the outset Cambodia tried to paper over the cracks that first appeared at an ASEAN summit in July by publicly announcing that Southeast Asian delegates had early on unanimously agreed to not “internationalize” the festering dispute. While many have put their faith in a Code of Conduct some wonder if China is stalling for time. A real solution may take years, if ever.